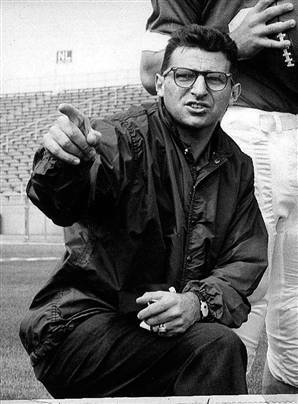 It is with great sadness that we announce that Joe Paterno passed away earlier today. His loss leaves a void in our lives that will never be filled. He died as he lived. He fought hard until the end, stayed positive, thought only of others and constantly reminded everyone of how blessed his life had been. His ambitions were far reaching, but he never believed he had to leave this Happy Valley to achieve them. He was a man devoted to his family, his university, his players and his community. He has been many things in his life – a soldier, scholar, mentor, coach, friend and father. To my mother he was and is her soul mate, and the last several weeks have shown the strength of their love. To his children and grandchildren he is a shining example of how to live a good, decent and honest life, a standard to which we aspire. When he decided to forego a career in law and make coaching his vocation, his father Angelo had but one command: Make an impact. As the last 61 years have shown, Joe made an incredible impact. That impact has been felt and appreciated by our family in the form of thousands of letters and well wishes along with countless acts of kindness from people whose lives he touched. It is evident also in the thousands of successful student athletes who have gone on to multiply that impact as they spread out across the country. And so he leaves us with a peaceful mind, comforted by his “living legacy” of five kids, 17 grandchildren, and hundreds of young men whose lives he changed in more ways than can begin to be counted. In lieu of flowers or gifts, the family requests that donations be made to the Special Olympics of Pennsylvania or the Penn State-THON, The Penn State IFC/Panhellenic Dance Marathon.